I have come to the realization that I am not anybody’s gym rat. I have a short attention span and having to do repetitions of lifts and raises and whatever else you do at the gym is not for me. So I have been trying to find new ways to get my “next summertime fine” body together. First thing I tried was 5K races. In September I did two runs (walks) back to back. It was great. I liked the fact that I was able to combine doing something good for me (burning a few calories) and doing something good for the community (each of these benefited a worthy cause). Even though I am signed up to walk in the Susan G. Komen 5K next week, I know that isn’t going to be enough to get all of these Miami Spice pounds off. First up was Indoor Rock climbing. It was supposed to be a group outing but you know how that goes. I ended up going with one other girl. It was fun… kinda. In retrospect, seeing that I don’t like heights it wasn’t my best option. I can officially say that I can belay with the best of them… but that’s about it. No Shade. Actually I do have to thank my indoor rock climbing experience for one thing. Had I not gone, I wouldn’t have seen the poster for fencing. 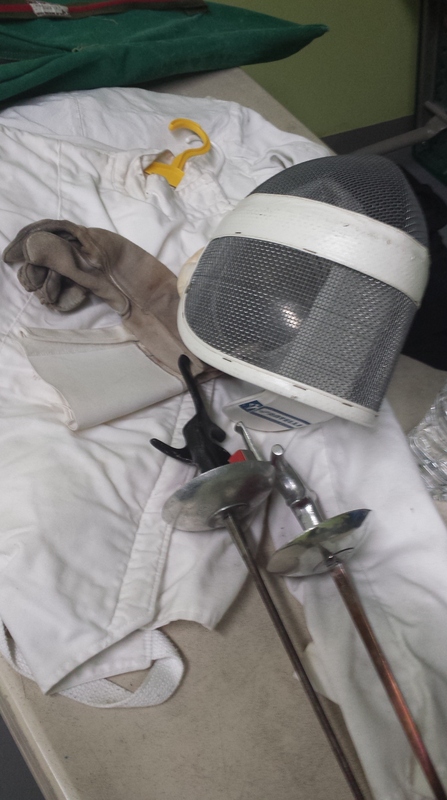 Ok let me be honest, fencing isn’t one of those things that was on the front page of my bucket list. It was more like one of those things that was scribbled on the back in pencil. It sounded reallllly cool with a side of badassness. But when was I ever going to fence in Kendall? Never. Well obviously not never as I did my first fencing class yesterday. I love freaking loved it. It was a small class, two teachers and two students. We had an hour and a half of drills, learning how to en garde, lunge, and parlay. By end of the night I was dripping in sweat (eww I know) and pumped to go harder. When I got home even though I was relatively sore, I wasn’t in pain. Even when I got up today, I definitely felt like I had gotten a good workout but didn’t have to pop pain pills. Did I mention my instructor was hot? Verrrrrry straight but hot. Made it very easy to keep my focus on her. *shrugs* Y’all know how I am so don’t act surprised. Who’s down for next week? At 20 bucks a class you can’t beat it with a stick… or a sabre (see what I did there). Oh and I bought a groupon for kickboxing… I can’t wait to try that too. I am serving serial killer, bee keeper realness.